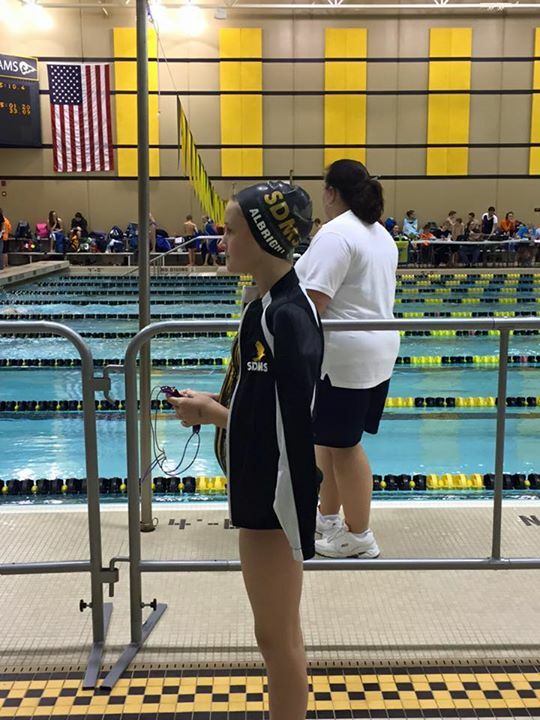 Over the weekend the SDMS USA swimmers, headed to SE Polk High School for the Riptide’s Capital City Classic swim meet (12/4-12/6). SDMS did great and finished 7th out of 15 teams (including groups of unattached swimmers). The athletes swam several fast swims and/or personal bests which is great as we approach the halfway mark of the winter season. This meet had prelims/finals format for swimmers over the age of 11, a different set-up than usual. In prelims/finals format, all athletes entered into a event swim in the preliminary round. Then the top finishers in the event are selected to swim again later in the day for the finals round. The numbers of athletes in the finals varies at each meet. The finals round is what counts for ribbons/medals (if applicable) and team scoring. This style of meet is also used at the Olympics. Great job Seahawks! Below are a just a few highlights from the recent USA meet. Ellie Dueland took 1st place in the 8 and Under Girls 50 Breaststroke with her time of 53.08! ACAC Winter Classic | Ames High School, Jan. 15-17: Sign-ups for this USA meet are open until 12/18 at noon. We’d love to see our SDMS USA swimmers of all ages sign-up in big numbers. This meet boasts great competition and is a good opportunity to earn a spot at Midwest Regionals and/or ISI State. Good luck! !